You can add custom text to your survey link to add a personal touch when sharing your online surveys. First you must create a Survey Link Collector. 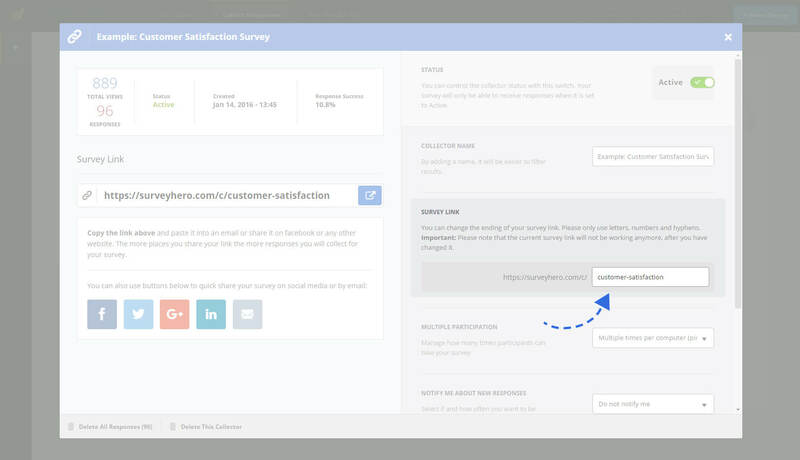 After you create your collector go into the settings where you will find a section with the title “Survey Link”. Type the custom text you want to appear in your link into the input box provided. As you type you will automatically be shown if the custom link is available to use. Only alphanumeric and hyphen characters are allowed. If the text you entered has been used by someone else then you will not be able to use it. Be careful, if you have already shared the old link then it will no longer work after this change. In this case, we recommend that you create a new link collector and leave the old one with the link unchanged.